The Grunderhof, which has been in the possession of one family for more than 400 years, is located very close to the valley station of the Klösterle chair lift on Gerlitzen. The farm is known for its suckler cow calves (Charolais cattle), as well as a large pond-farming, keeping brown trouts and brook trouts. Being situated amidst the Nockberge (a mountain range known for its soft and green slopes), our guests are presented with the best location for a relaxing holiday – in the summer as well as in the winter season. 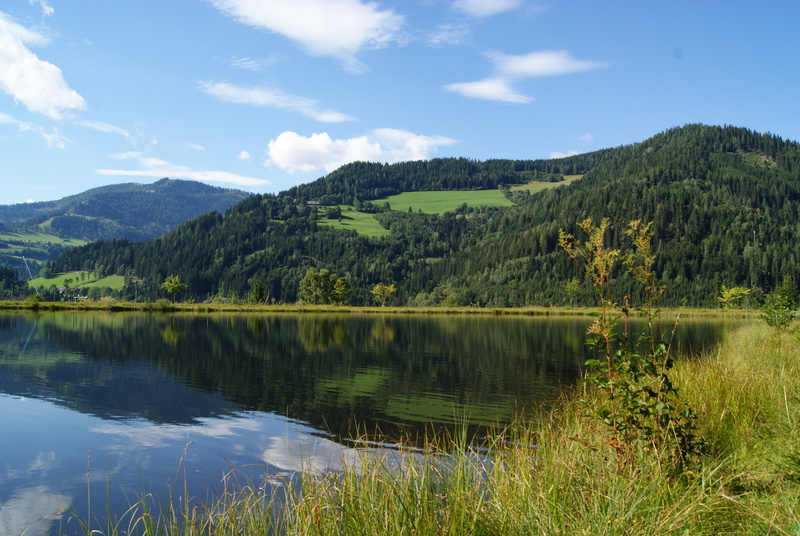 Whether you are sporty and active and keen on hiking or skiing, or you prefer Nordic Walking tours, or to relax at the mountain lake nearby the farm – enjoy the many opportunities Carinthia is offering! Experience absolute freedom from the very first moment on! Starting with the booking – choose your day of arrival and departure. We welcome you from Monday to Sunday and thus provide you with a completely stress-free travel. At the farm, “no program” is our motto. This means we will grant you the freedom to plan your day to your likings. Our aim is to give you the time and space to spend your holiday with your loved ones – without any stress! We offer apartments on three floors, granting enough space for up to Maximum 4 persons (45m2; 2 adults, 2 children). Every apartment has a kitchen, bathroom, a living and dining area, a bedroom and a balcony or terrace. They also have a tiled stove to be heated by the guests. The apartments A and B are on the lower floor and have a terrace each. They can be entered through the foyer/staircase as well as the terrace. Apartments E and F are on the upper floor, have Mansard (attic) rooms and have a smaller balcony and can be entered through the staircase. The Living- and Dining Area: With a comfortable sitting area, a chest of drawers, and a rustic tiled stove, the living area is an ideal place to relax. The terrace or balcony is your window to the surrounding nature. The Kitchen: equipped with a small kitchen including a fridge and a freezing compartment; 4 plates stove with oven, extractor hood and coffee machine, the kitchen can be used to cook a full meal, if you prefer to do so. Dish towels and dishwasher detergent are provided. The Bedroom: A double-bed and a sleeping berth with a bunk bed for the kids offer a cozy sleeping environment. The two areas are separated by a wall with an open door or half a wall with a curtain attached.